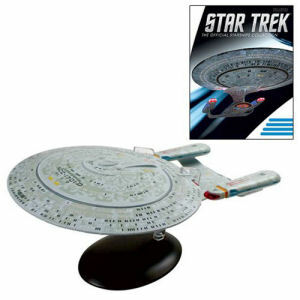 We have Just Sold out of Star Trek Starships Large Enterprise NCC-1701-D Special #11. Not to Worry! Fill in the Notify me When Available and you will be the first in line for our restock of Star Trek Starships Large Enterprise NCC-1701-D Special #11 !! From the Star Trek Starships collection by Eaglemoss Publications. Star Trek Starships Large Enterprise NCC-1701-D Special #11. Add this incredibly detailed oversized diecast starship to your collection. Starship comes with a collector magazine! Ages 14 and up.